Gamification is a user-centered approach that increases traffic and engagement for a product. Have you ever thought about using it? In this article, you’ll discover how gaming elements improve user retention and heighten a mobile app’s value. Since gamification means applying fun features from games to the tech world, it also encourages users to return and try a product again. This tactic has a huge impact on human behavior by making things more fun and exciting for people. So let’s find out why gamification is necessary for your product and how to gamify it. Do you want to attract more users and increase acquisitions for your app? If so, gamification is a sure-fire solution for it. Yu-Kai Chou uses the term “Human-Focused Approach”, which explains how fun activities from games can be applied in digital products. By making things appealing to people, gaming prompts them to do various things, from sharing photos to completing routine tasks. Gamification is helpful in mobile apps because elements from games create a playful experience for users. There are a couple of reasons why you should consider this technique, but the main one is a gamification is a great option when your goal is to combine user acquisition with retention. 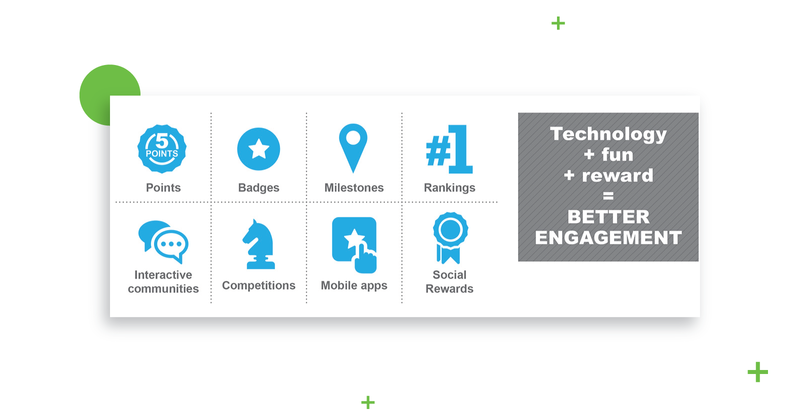 In effect, gamification helps you create a mobile app that provides sustainable customer growth. App Samurai states that gamification in apps encourages users to share information about the product with others, which increases engagement. In the image below, you’ll see five elements that can influence the way people interact with a mobile app: rewards, badges, virtual goods, leaderboards, and progress displays. All of these features help create a unique experience for mobile users and prompt them to come back and try the product again. Either way, gamification is a great tool for you if you want people to complete tasks which they might otherwise refuse to do, or to engage more users with your mobile app. But bear in mind that if you adopt this technique, customers might spread the word about your product. When you gamify your mobile app, consider using gaming tactics such as challenges and rewards. These techniques affect user behavior and create exciting experiences, which encourage them to try the product one more time. How can we motivate people to continue using a game? Let’s check out some gamified app that are effective at generating user engagement. 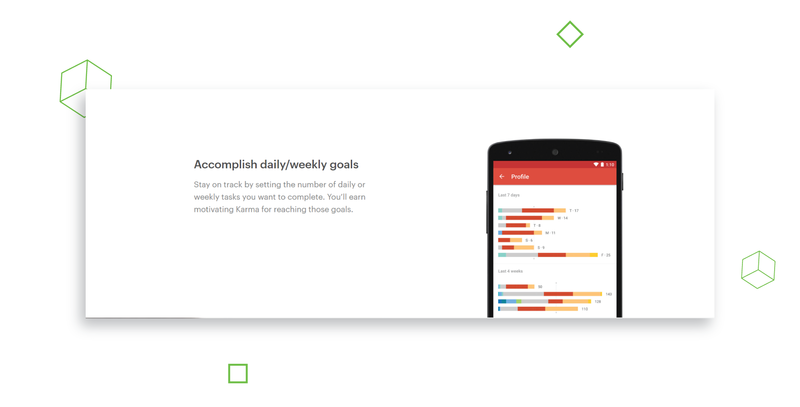 Todoist Karma is a gamified productivity app that measures the users’ progress toward their goals. Its point system ranks and motivates a player to complete the goals. When the tasks are finished, the player gains Karma; if they are not, they loses. In this way, a user accepts a challenge and, after its completion, gets a reward. The other benefit of Todoist Karma is that players must achieve their objectives again to retain their status. If you refuse to follow up on tasks or postpone them, you lose points. Bounty Tasker is a mobile app with gaming elements that creates a to-do list for goal-setting. As a player, you choose a character and assign tasks to yourself, which give you “experience” points after a task’s completion. The more experience you get, the higher the level you obtain in a game. Challenge Timer uses the Pomodoro method, which breaks large projects into tiny parts, making them more doable and easier for the player. Its Challenge Timer encourages users to finish tasks during a specific period. When they are completed, the task is ticked off as “achieved,” which gives the user a good feeling. Beeminder is a tricky tool for those who don’t like losing things. If you don’t follow your goals, the app charges you $5. Sounds crazy, right? Beeminder has a “yellow brick road,” which keeps the player on track. Every day, the app asks you about your goals. If you accomplish them, you stay on track. If you go astray, Beeminder gives you 24 hours to finish the task; otherwise, it charges you $5. Challenge Timer, Beeminder, Bounty Tasker, and Todoist Karma use all challenges and rewards in their products. Do you want to engage more users? Then use competition as a gaming element in your app. Sound interesting? If it does, let me tell you about Fitocracy, a gamified productivity app for fitness lovers. Fitocracy establishes online sports teams in which everyone encourages each other. You can receive badges for your accomplishments, which level you up in the app and pit you against other users. This is how competition can gamify your mobile app, engage users, and increase traffic. If your mobile app relates to educational purposes, entertaining your users is a perfect way to help them learn a new skill. It makes things fun and more exciting for users. Want to know how companies help people learn languages, to code, and other activities? We’ve prepared a list of educational products that use entertainment in their mobile apps. 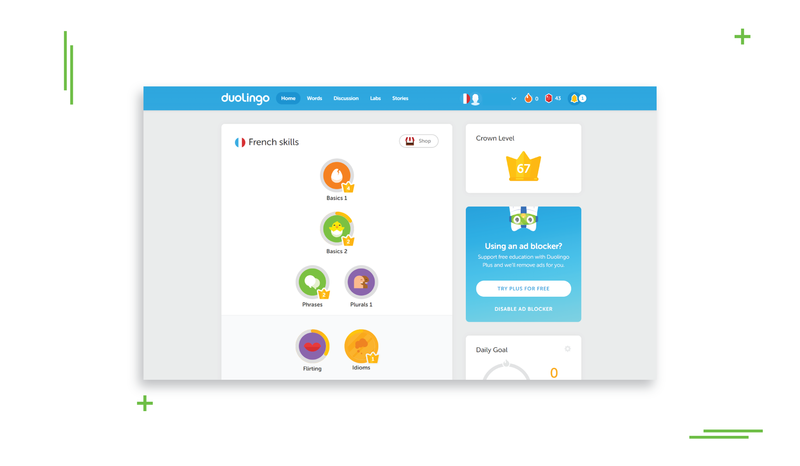 Duolingo helps you learn a foreign language for free. It has a set of gaming interactions that allow users to track their progress and practice their linguistic skills. Khan Academy is an educational platform where students can learn math, coding, arts, and other subjects for free. Most of its lessons have an interactive form of communication with the user, which makes their experience interesting and thought-provoking at the same time. Tinycards is a gamified educational app that uses flashcards to help the user learn new things. It has a set of cards, and when you progress, you earn additional points. Using exciting games, people can easily assess and track their results. Smarty Pig is a mobile app that helps you measure and track your personal finances. If your goal is to save money, Smarty Pig makes this process extremely easy for you. Its set-and-forget technique is smart and savvy. Smarty Pig tracks your real-life purchases and saves some money on your account. Epic Win is a gamified app for people who want to change their lives. Its RPG concept creates a fun experience for users who, using imaginative character and game animations, can measure their productivity. In Epic Win, everyone sets tasks, and assigns and completes them. When players accomplish an objective, their character is leveled up in the system. Have you ever dreamed about saving the world? Forest App is an exciting mobile app aimed at making our lives better. If you want to plant a tree, set it as a goal on your account, and track it. Afterward, you’ll see the results, and other users can spend coins on your project. As you see, gamification helps users upgrade their skills and achieve their personal goals. Consider adopting this strategy for your product. If you do, you just might retain your users, acquire new clients, and scale your business!